Installer: Multimedia Resource Group, Inc. The audio system is a state-­of-­the-­art 3D sound system incorporating Auro3D technology, which creates a 3D dome of sound for a completely immersive experience. There are a total of 13 speakers, 2 subwoofers and 5 amplifiers from Pro Audio Technology, driven by a Datasat Digital RS20i Surround Sound Processor. Sources include a Kaleidescape movie server, Oppo Digital Blu-ray player, AppleTV, and a FiOS cable box. There is also an MMS-­5A music server from Autonomic Controls for access to the client’s entire music library, as well as every conceivable streaming option. 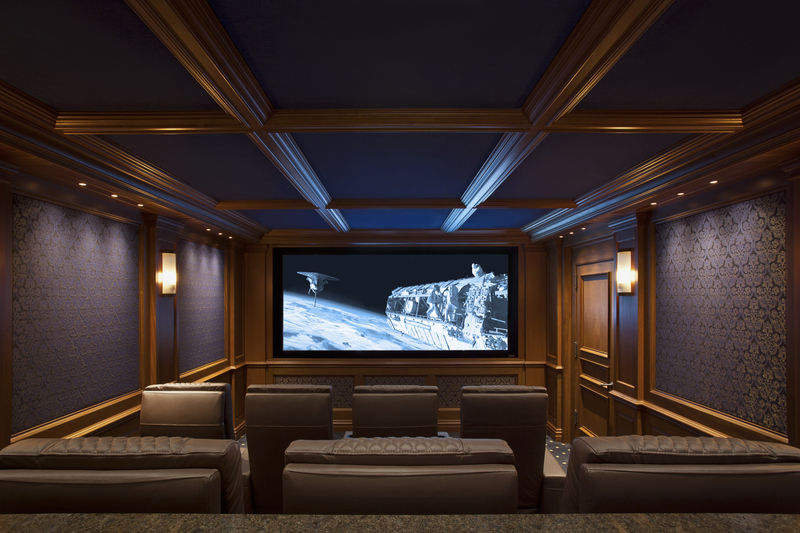 The entire system, including all 11 lighting loads, is controlled from a Crestron TST-­602 wireless touch screen. Video is produced using a top-­of-­the-­line SUPERLUMIS 3-­chip DLP projector from SIM2, which is fed from a Lumagen Radiance video processor. The Lumagen accepts every source and sends a perfect signal to the projector. 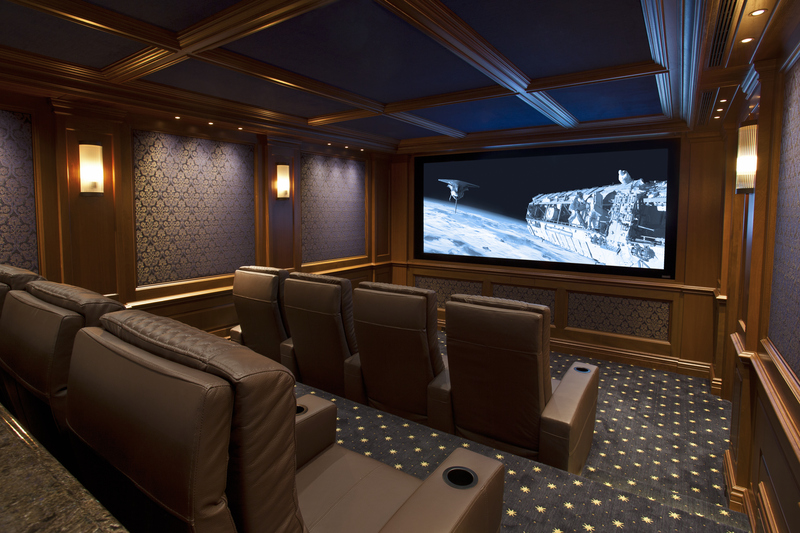 The stunning image is displayed on a 120” wide acoustically transparent screen from Seymour Screen Excellence. The 4K Enlightor woven screen material allows perfect placement of the speakers behind the screen with no sonic impact. The material also has no discernible pattern to impact the picture quality. The screen includes motorized masking so the aspect ratio can be changed based on the content. Power to every component of the audio / video system is fed from a 45-­amp Torus Power balanced AC regenerator. The 40 amp, 240 volt balanced input, surge suppression and automatic voltage regulation ensures only perfectly clean, stable power reaches the equipment. The entire room is encased in 1/8” thick Acoustiblok soundproofing material, creating an acoustically sealed envelope. Additionally, the walls are isolated from the structure using specialized clips from Kinetics Noise Control. The ceiling is isolated in a similar fashion using commercial spring hangers from Mason Industries, which are engineered for the added load of the coffered ceiling. The walls and ceilings, both inside the theater and in the adjacent rooms, are covered by a combination of plywood and QuietRock, a specialized sheetrock with sound deadening properties. All voids are filled with acoustic insulation. Two soundproof doors from Kinetics Noise Control complete the soundproofing envelope. Complementary to the soundproofing, the inside of the theater is a combination of reflective, diffusive and absorptive surfaces, which combine to create the acoustic treatment within the room. The finished look is accomplished with acoustically transparent fabric from CINE ­Living. 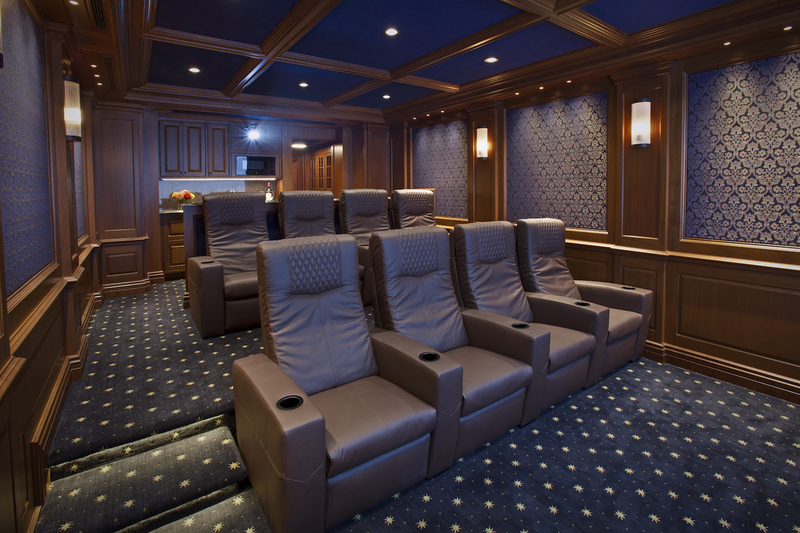 Eight custom Ferrier theater seats from Cineak complete the experience. The seats are covered in luxurious leather and feature articulating headrests, independent motors for the footrests and back rests, and are uniquely designed for all-­day comfort. Multimedia Resource Group Inc. designs, installs and services custom electronic systems to meet specific client needs. Whether it’s a high-­end residence, corporate boardroom, commercial showroom or a 280-­foot yacht, every detail is considered for the best fit, value and performance. Systems Integrator – David Kepke, Multimedia Resource Group Inc.